We are aware that an increasing number of customers are using Microsoft SharePoint to store and manage their documents. Indeed this was a subject of discussion at the last User Group meeting. This article aims to explain the two methods which can be used to integrate SharePoint with your Process Library, whereby documents stored in SharePoint can be searched from your Process Library. All documents stored in SharePoint can be searched via your Process Library documents search (both Quick Search and Search Documents) and the results displayed in the standard library format, within the 'Documents Search Results' tab. In order to set this up, a UNC path to your SharePoint repository needs to be set up by your SharePoint administrator. 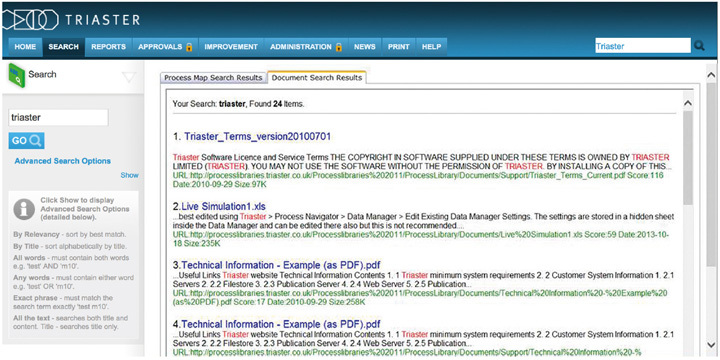 Triaster can then configure your Library's documents search to list the documents stored in SharePoint. Documents stored in SharePoint can also be searched via your Process Library documents search by passing a search term through to SharePoint. The results then displayed within the 'Documents Search Results' tab, are as returned by SharePoint. 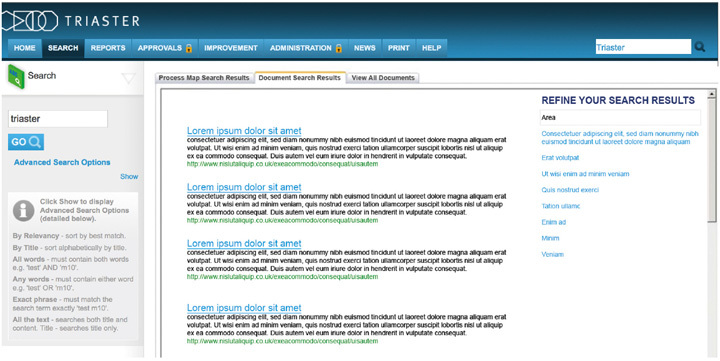 The results of a SharePoint search will typically be displayed in the format shown above. Actual results have been replaced with dummy text. This search is configured by specifying the URL of the SharePoint repository that is to return the results within the 'Document Search Results' tab. The Triaster software will automatically add two additional parameters to the URL - search term and library. This allows the search phrase entered by the user to be passed into SharePoint without the need to re-enter the phrase. The library parameter allows separate document areas for each library to be set up in SharePoint if required. It's also possible for a third tab to be used to display the Search results. In the example above, a third tab has been set up called 'View All Documents'. This is completely configurable however so the third tab could be used, for example, to expose the full SharePoint search interface to the users (while say the 'Document Search Results' show the results from passing a search term through to SharePoint - as described above). If a URL is configured for this, an additional tab will automatically become visible; otherwise the third tab will stay hidden. 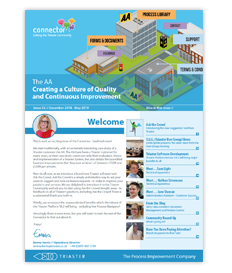 If you are interested in integrating your Process Library documents search with Microsoft SharePoint please contact Customer Services by either e-mailing customer.services@triaster.co.uk or calling +44 (0)870 402 1234 and speaking to either Jo Dolton or Emily Constance, to discuss your specific requirements.